Accommodation at Solar de Chacim. 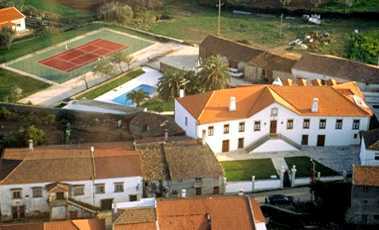 This 19th Century Manor House is in the village of Chacim, 12 kms south of Macedo de Cavaleiros, in the region of Tras-os-Montes. A literal translation of the region is 'behind the hills'. The region is sparsely populated with vast unspoilt landscapes in which the traditional ways of life and historical landmarks are preserved. The town of Macedo de Cavaleiros was founded during the Middle Age when it was owned by religious Knights, which gave origin to its name. It lies in the shelter of the Bornes mountain. Solar de Chacim is part of a large, well cared for property which is ideal for a restful and relaxing stay. There are six comfortably furnished central heated bedrooms on the first floor of the house. All rooms have a private bathroom and have a telephone. Solar de Chacim has a swimming pool and a tennis court in the beautiful garden. Other facilities and services include private car park, free wireless internet and bicycles are also available for guests. Bornes mountain is excellent for walking or mountain biking with scenic views. The nearby Azibo Lake is available for water sports. About 25 kilometres is the town of Mirandela which is famous for local sausages called 'alheiras' which should be tried at one of the many local restaurants. Within reach is the town of Braganca, the most famous town of Tras os Montes. Inside the walls is the castle of Sancho I which was built in 1187. The well preserved watchtowers and dungeons are a feature of the castle. Braganca also has the Domus Municipalis, where the "good men" used to settle disputes. It is the only surviving example of Romanesque civic architecture in Portugal. North of Braganca is the Montesinho Natural Park which is one of the wildest areas in Europe. Wonderful views of the park can be enjoyed on a journey to Vinhais, 30 kilometres from Braganca. The road passes through villages of old stone houses with wooden balconies and cobbled streets. The nearest international airports to Solar de Chacim are Porto in Portugal and Valladolid in Spain. These are both slightly over 2 hours drive away.